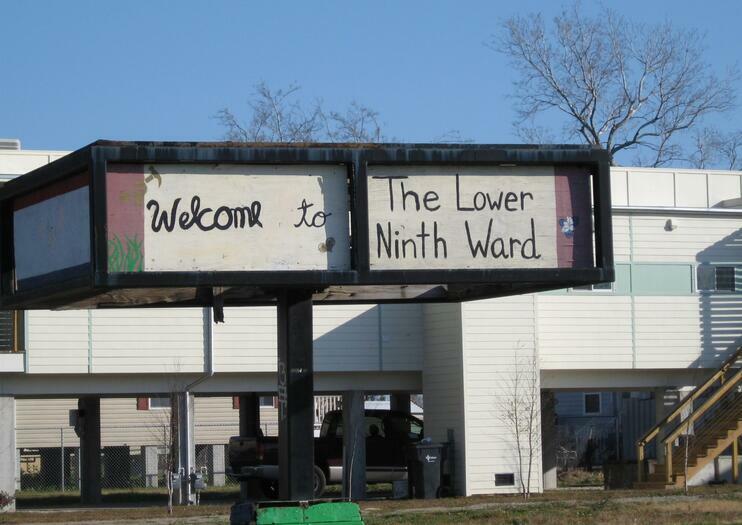 A shell of its former vibrant self, the Lower Ninth Ward neighborhood is still dotted with the abandoned houses and overrun, empty lots that serve as reminders of the devastating impacts of Hurricane Katrina. The working class and predominantly African American neighborhood suffered the worst impacts of the 2005 storm, with floodwaters reaching 12 feet in some places, lifting houses from their foundations. Visitors to the region today will find some reminders of that troubled time—a handful of eerie search team marks still adorn garage and home doors—but the vibe in the Lower Ninth today is one of hope, inspiration, and resilience. Revitalization and repopulation has been painstakingly slow, but new construction is taking place, including more than 100 ultramodern and energy-efficient homes built by a foundation headed by the actor Brad Pitt. Other popular Lower Ninth Ward sites include the Fats Domino House (1208 Caffin Ave.), actually a recording studio for the famed French Creole pianist and singer-songwriter; the striking, Victorian-style “steamboat houses” (Egania Street), which withstood some of the storm’s worst impacts; the Jackson Barracks Military Museum (6400 St. Claude Ave.) featuring military artifacts, weapons and memorabilia owned by the Louisiana National Guard; and the Lower Ninth Ward Living Museum (1235 Deslonde Street) with displays and oral histories from neighborhood residents. The Lower Ninth Ward of New Orleans is in the easternmost downriver portion of New Orleans and is connected downtown and the rest of the city by a bridge over the Industrial Canal. Several tour outfits offer walking or driving tours that explain the differences in the landscape since Hurricane Katrina. Bicycle rentals for self-exploration are also available in the area. Immerse yourself in the culture, history, and landscape of vibrant New Orleans on this half-day tour with a small group of 15 people or fewer. This experience combines elements from several disparate tours, including those focusing on architecture, the Garden District, historic cemeteries, the French Quarter, and recovery from Hurricane Katrina. Hotel pickup included. Discover New Orleans’ top attractions and the grandeur of antebellum history on this combined city and plantation sightseeing tour. Start with a bus tour, including the French Quarter, the Garden District, the Ninth Ward, and City Park. Absorb the sights and sounds of the city as you learn about its fascinating history from your friendly local guide. Then head to Oak Alley Plantation to view stunning architecture, oak-lined esplanades, and enduring sugar cane fields. Experience the best of southeastern Louisiana culture and nature on this combination excursion. After a convenient hotel pickup, explore top New Orleans attractions like Congo Square, Treme, and St. Louis Cemetery No. 3. See the impact of Hurricane Katrina, sample beignets, and learn about the origins of jazz. Then enjoy transportation to Airboat Adventures and watch for wildlife on a swamp tour. Treat yourself to New Orleans 'your way' on a 3-hour private city tour! By luxury car or SUV, travel through the French Quarter, St Louis Cemetery No 1, the Garden District, the Ninth Ward and City Park. Absorb the sights and sounds of the city as you learn about its fascinating history from your personal chauffeur. On this highly flexible tour, you have the liberty to request stops for photo ops and to get a better look at a favorite location.